Emergency care settings in Ireland have struggled with a high volume of service users in recent years. 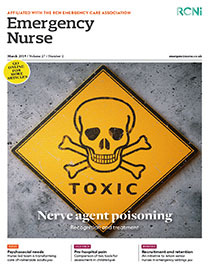 This nationwide crisis led to the establishment of the National Emergency Medicine Programme Strategy in 2012, which identified two key performance indicators (KPIs) for efficiency in emergency care: the patient experience time (PET), which should not exceed six hours from the time of registration to the time of discharge; and patients who do not wait for treatment (DNW) should make up less than 5% of those attending emergency care services. This article explores a quality initiative to improve DNW rates using scheduled return clinics, implemented by a group of advanced nurse practitioners (ANPs) in an emergency department in a Dublin hospital. It reviews the literature on scheduled return clinics and discusses the rationale for the initiative, its implementation, barriers to its introduction, and an audit of its effectiveness.